Feta - Lesbos, Greece - Essex Street - Zuercher & Co. 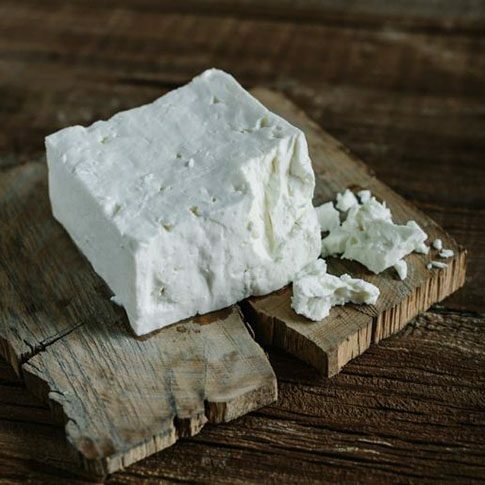 This feta comes to Zuercher & Co. from the village of Agra, located on the island of Lesbos, Greece. Unlike most feta on the market, this is an authentic cheese with a Protected Designation of Origin (PDO) status and is the only Greek island bearing a PDO for feta production. Essex St. Feta is sourced from the third-generation producer, M. Tastanis, who in turn sources sheep’s milk from the village’s shepherds. The pasteurized milk is provided by the native Lesbian breed sheep, feeding on the herbs and flowers growing near the Aegean Sea. Production occurs during only 7 months of the year. One of the reasons why this is special is that Agra shepherds do not separate lambs from their mothers for a specified period after birth. The natural cycle of ewes nursing their young is respected. With a combination of evening and the following morning’s milk, a bit of yogurt and starter culture is added to start the curd formation; traditional rennet is added to the mixture. The curd is cut; the batch is salted (with sea salt procured from nearby Kalloni), pressed, and then salted again over a number of hours. and texture is snowy white with a tender, slightly crumbly curd. You will notice an aroma of fresh seawater, yogurt and cream. Its flavor is clean, sweet and buttery, citrusy and mildly grassy.